25 free spins Play Now! Debate continues to rage as to the exact location of El Dorado, a mythical lost city of gold that is said to reside in South America. Most likely, there never was the El Dorado that has been depicted in movies, but at least we can enjoy the myth in the Gonzo’s Quest slot at NetEnt casino sites. Gonzo’s Quest was first introduced by NetEnt casinos in 2011 before mobile accessibility was a given feature. Since then, however, NetEnt has optimised Gonzo’s Quest in order to be presented on a variety of mobile platforms, such as Android, Windows, and iOS. This video slot stars an animated character called Gonzo, who is a Spanish conquistador seeking out El Dorado and his fortune. You can join him for the adventure by playing this five-reel slot and trying to align symbols from left to right along the 20 fixed paylines. Wagering, meanwhile, can begin from a coin value of €0.01 and betting level of one for a minimum wager of €0.20. Far above that, Gonzo’s Quest can accept a €0.50 coin value and fifth betting level for a €50.00 total wager. When it released, what set Gonzo’s Quest apart was that symbols fell into place on the reels. And this was to facilitate the Avalanche Multipliers feature in the base game. Basically, this causes winning symbols to disappear and be filled by falling symbols. In turn, the multiplier bar can climb through 1x, 2x, 3x, and 5x. 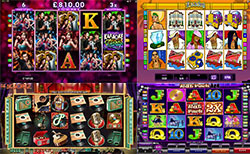 • Free Falls: these are in place of free spins and can be triggered with three golden squares on the same payline, thus granting 10 Free Falls. • Boosted Avalanche Multipliers: during Free Falls, the Avalanche Multipliers shall be boosted to instead rise through 3x, 6x, 9x, and 15x. Please note that a break in the streak sends the multiplier back to the start. Gonzo’s Quest is one of the most popular NetEnt slots ever to be made, and it’s with good reason, as the game was years ahead of its time with the falling symbols and avalanche multipliers.